Arrived in Birmingham last night and drove straight to the Hassinger Daniels Mansion Bed and Breakfast. It’s a grand old Victorian building that was restored just a couple of years ago. 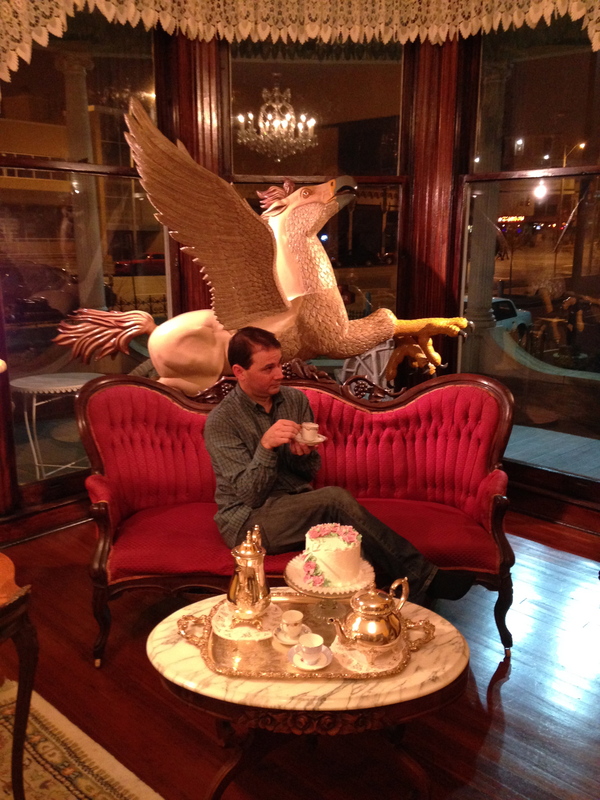 The owners have clearly spent a lot of time at estate sales and antique shops. And one of the owners does carousel carvings! 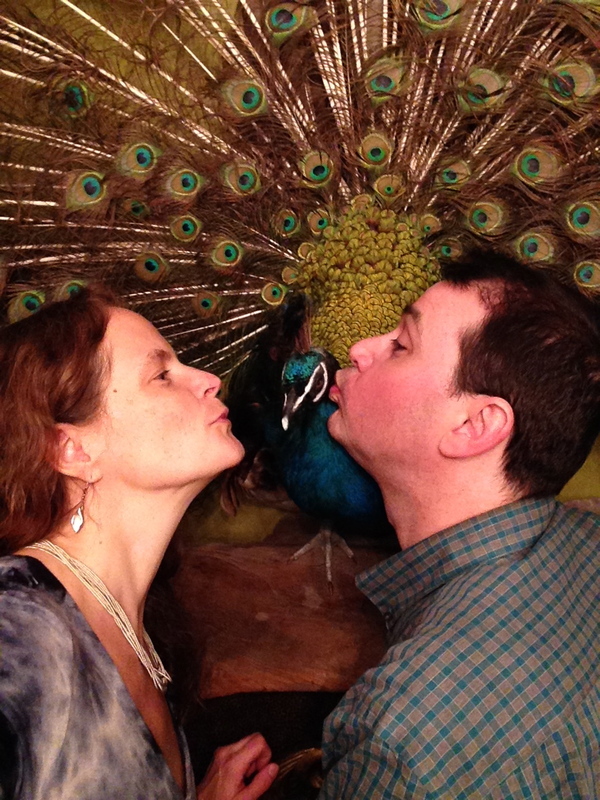 We are in the Peacock Room. 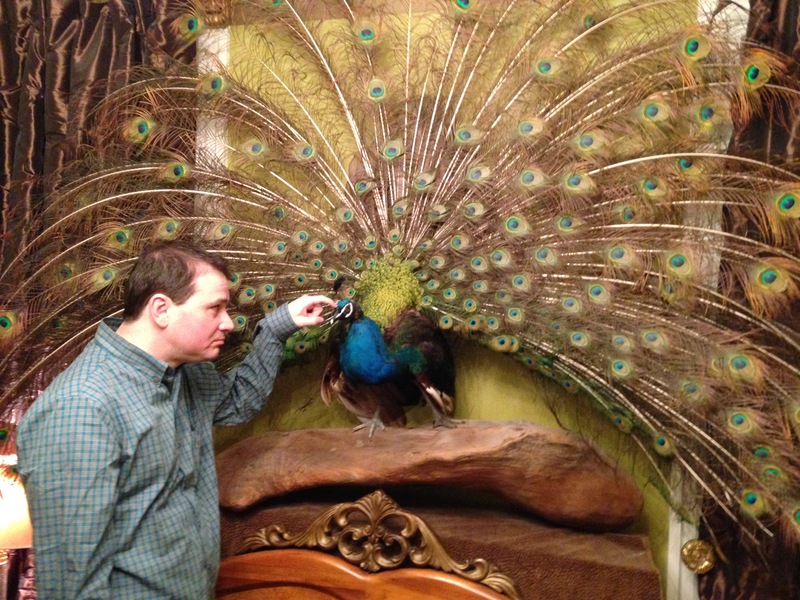 This means that, yes, we are sleeping under a giant taxidermied peacock. This is, in fact, as strange as it sounds. Breakfast this morning was followed by the owner’s “Victorian parlor game:” she has ten items laid out on a table, all at least 100 years old, and you have to guess what they are. Some were easy: stereoscope (thank you, Grandma & Grandpa); ice skate; screwdriver. Some were impossible: hair receiver; boot lacer. It was a surprisingly fun game that spurred some interesting conversations. We spent a lot of time talking about the house, construction, and the owner’s vast collection of stuff. This home is really beautiful. 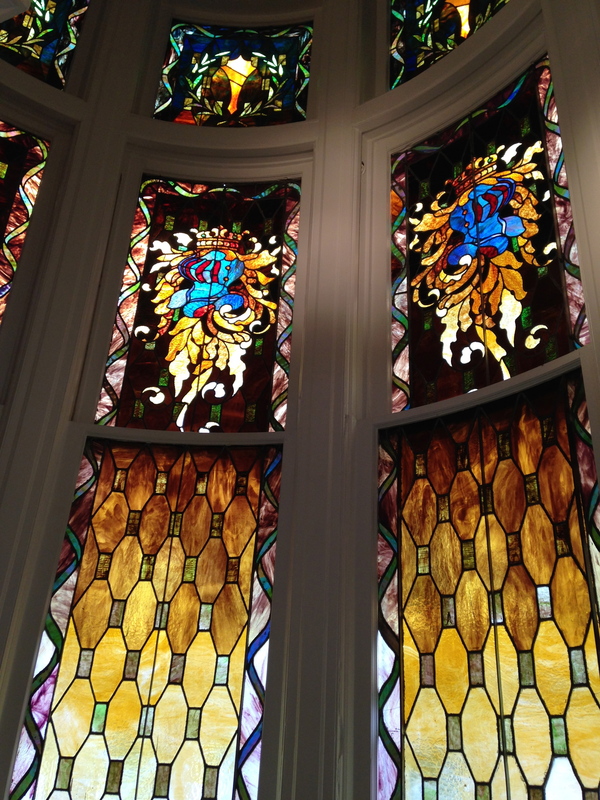 There’s clear attention to detail everywhere, and stained glass windows stretch up the three-story staircase. 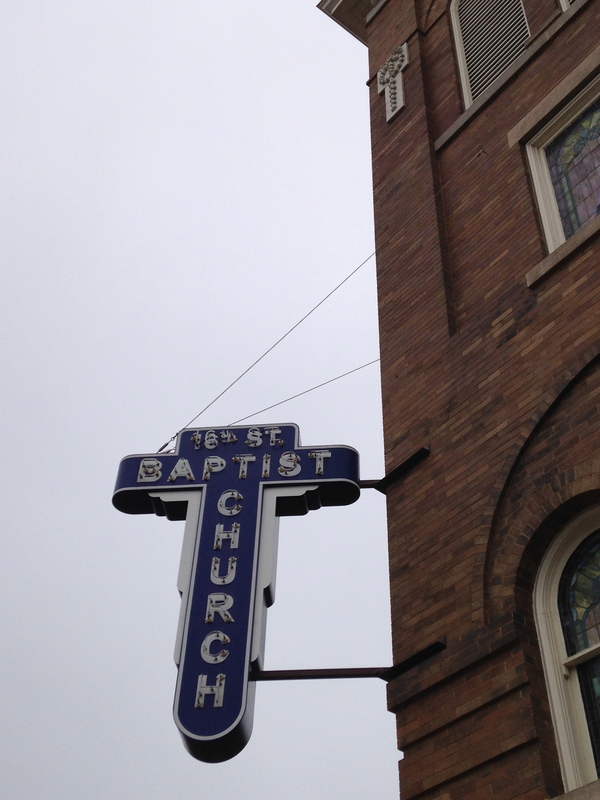 At 10:00, we headed over to the 16th Street Baptist Church. This church is best known for the bombing that took the lives of four girls there in 1963. But what’s probably less well known is that this was also a central gathering place for civil rights workers and speakers throughout Birmingham’s civil rights movement. 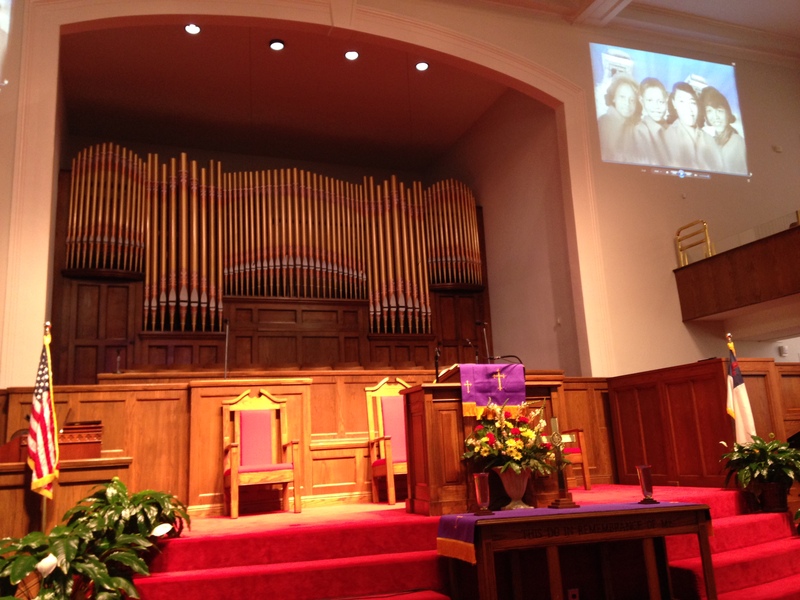 Martin Luther King, Jr., Paul Robeson, Mahalia Jackson, and Marion Anderson each stood at its pulpit. It was powerful just to sit in the sanctuary and imagine what it might have been like fifty years ago. 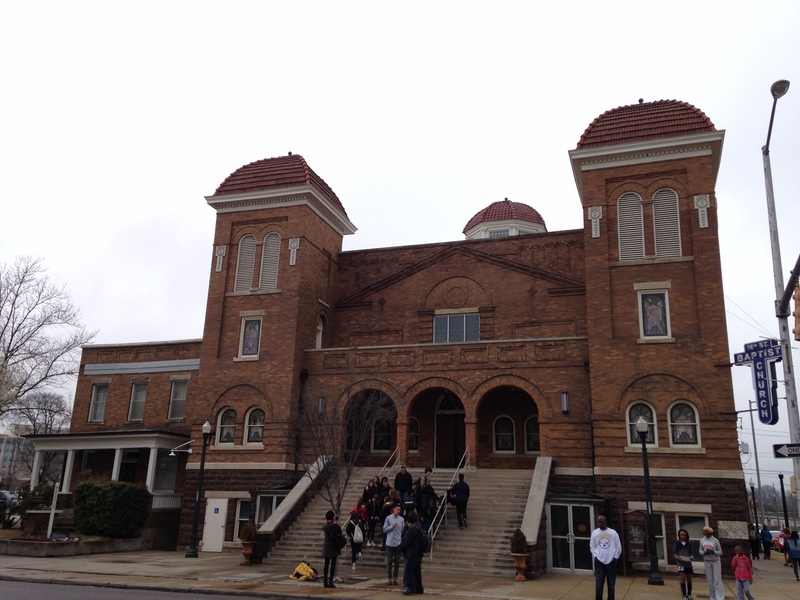 We then crossed the street to the Birmingham Civil Rights institute. “No food, no drinks, no gum, no phones, no photos” — so we don’t have any pictures to share. But this was a remarkable museum that takes visitors from Birmingham’s post-Civil War founding through to the present day. The museum does a spectacular job of blending photographs, newspaper clippings, TV and video footage, and small write-ups as it walks the visitor from one decade to the next. I spent a lot of the time there with tears in my eyes. The Civil Right Institute overlooks Kelly Park, which is the infamous site of Bull Connor’s siccing police dogs and fire hoses on the kids in the Children’s March. It’s a quiet park now — aside from the sculptures and plaques, you would never guess that anything both terrible and terrifying had ever happened there.